Two species of hawthorn, C. Tataegus monogyna and C. oxyacantha, are native in Britain. is less thorny and more shade-tolerant - a hawthorn of the woods. The two are hybridised in the South and East, where they grow together. The name monogyna means that the flower is one-styled (and the berry has only one seed). Oxyacantha is simply a name for a thorn: the flowers of that species have two or three styles. Cultivated garden hawthorns, with red flowers, usually belong to this species. There are others, many others, for instance an oriental hawthorn with yellow or orange berries. 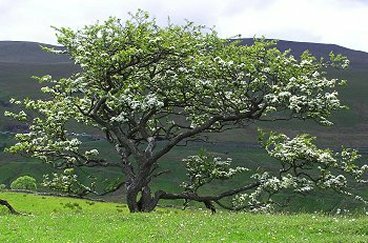 The history ofthe hawthorn in Britain goes back beyond the last Ice Age: a single seed-stone from an interglacial deposit was given the elegant name, Crataegus clactonensis. Like several other shrubs and small trees, hawthorn began to spread widely with the first forest clearances of neolithic man. It is a pioneer, which on neglected land can form continuous scrub - often with a field layer of old tins, to our shame. On the rich soil of old forest land the trees grow up into small, gloomy woods, in which nothing else can grow. It is often seen as an isolated bush or tree, protected by its thorns from the sheep and very often in the past protected by superstition. It may form scattered scrub on southern hillsides or it may be an isolated tree in the middle of an Irish field, oron top of a moor, as in the picture at the head. Hawthorn scrub is sometimes coppiced. The timber is hard and fine-grained. Hawthorns and their history are impregnated with magic and superstition so varied as to result in opposing customs. For instance it is unlucky to bring hawthorn into the house: it may cause your mother's death. But in another county it may be hung over the chimney-piece on May Day to keep away evil spirits. In Ireland (and elsewhere) it was thought dangerous to cut a thorn tree, and this explains the presence of mature trees in unexpected places. Sometimes the trees were hung with rags and clothes for the fairies. The May Queen, the prettiest girl in the village, was crowned with May blossom. By the old calendar, which held until 1751, May Day fell up to ten days later in the year, and the blossom was sure to be out by then. The May King, a dark figure, often completely shrouded in leaves, sometimes in a cage, was the Jack-in-the-Green often carved in old churches, but seldom mentioned. In many old rituals he was submitted to forms of sacrifice. Thus was the old year with its evils exchanged for the fertile new year, the young of the parish spending the previous night in the woods, and the day in dancing round the maypole. The maypole itself was a relic of tree-wakening rituals as well as a fairly clear phallic symbol. Joseph of Arimathea, when he came to preach the gospel in Britain, landed on the (then) Island of Avalon, He stuck his thorn staff into the ground and slept. When he woke, his staff had blossomed; so he built a chapel there, which later became Glastonbury Abbey. Here the thorn and its descendants continued, and bloomed at Christmas. (When the calendar was changed it bloomed on Twelfth Night.) Many cuttings were taken from it, resulting in the variety, praecox, the Glastonbury thorn, which blooms in winter as well as in May. Puritans attempted to cut down the tree, but it put their eyes out with its thorns, or the cutters went lame.